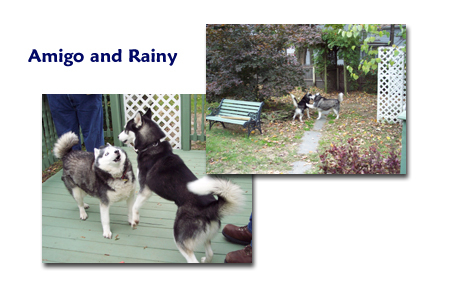 Amigo found his new home on October 29, 2005 with Keith and Bonnie and their husky Rainy. 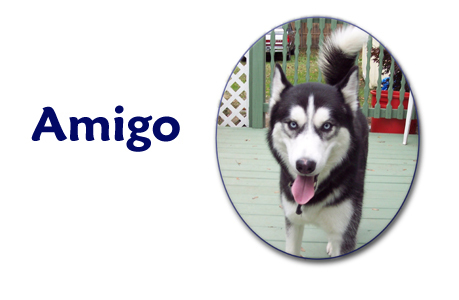 Amigo is an owner referral dog who needed to find a new home. He was found by a good samaritan tied to a tree by railroad tracks and they took him in a promised to find him a forever home as they were unable to keep him. On October 29, 2005, Amigo found his furever home with Keith and Bonnie and their dog Rainy, as well as the resident kitties! The dogs got along very well and were playing within the first 10 minutes of meeting each other! They have a nice big yard to run and play in and were taking advantage of that through the whole adoption. Amigo is a stunningly handsome boy who captured the hearts of Rainy and the his new humans and we are so glad to have been able to assist them in this union!